What better way to show someone you care, than by giving them an experience that they’ll never forget? 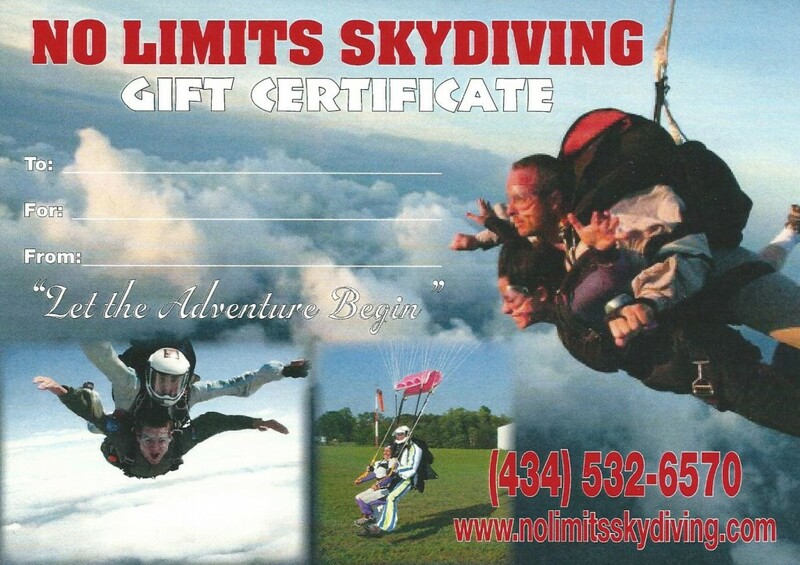 A Tandem Skydiving Gift Certificate from No Limits Skydiving™ makes a great gift for any occasion. Rather than spending money on something that will sit in a cabinet or closet, the gift of skydiving is something that they will talk about for years to come. Give the gift of adventure! The experience of free falling from the sky is an indescribable feeling that one can only gain from jumping from an actual plane. No Limits Skydiving™ makes it easy for anyone to make their first skydive. With safety as our number 1 priority, you can trust that we will do everything to make sure that your loved one has a tandem skydiving experience that is fun, easy, and above all, safe. Learn more about skydiving, or read what happens on a skydive. The price for Tandem Skydiving Gift Certificate is $220. This price covers their entire jump, and there are no other fees. You may purchase a tandem skydiving gift certificate online or by calling us at (866) 553-2915. Our staff will answer any questions you have and take orders right over the phone. We accept MasterCard and Visa. If purchased by phone, allow three days for the gift certificate to arrive by mail in a specially made envelope. If you need it earlier, we can overnight the gift certificate and will only charge you the extra mailing cost. If purchased online, you will be able to print the gift certificate out at home! Did you receive a Tandem Skydiving Gift Certificate? All you have to do is call us at (866) 553-2915 to schedule your tandem skydive. On the back of your gift certificate should be a number. Just let us know what number you have, which location you’d like to use, and when you are free. It’s that simple. We are ready when you are and are located near both VA Beach and the City of Richmond. 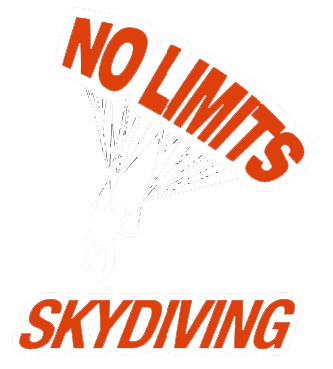 No Limits Skydiving™ is open 7 days a week for your convenience, from 8:00 AM to dusk. Our Tandem Skydiving Gift Certificates are good for 13 months. It’s common for some people to buy such a gift so early, so the recipient can have up to a year to plan for their tandem skydiving adventure. When they schedule their Tandem Skydive make sure you’re there to watch. Both of our locations allow friends and family to be right there when they land. You can even jump with them. Just let us know ahead of time how many adventurous souls are joining in on the fun, and how many are coming to watch. Additional tandem skydives can be purchased on the day you jump at our office. Is a skydiving video included on the Gift Certificate? Video is optional. Skydiving is such an adventure, that almost everyone has their skydiving experience caught on camera. When purchasing a Tandem Skydiving Gift Certificate, you can either include their video for an additional $60, or let them decide if they would like to buy the video on the day of their skydive. They’ll be able to pay for their video when they arrive at the office if you choose not to include it in their gift certificate. A video will allow them to relive their adventure again and again.